Use IP GeoPoint data to target and deliver offers customized by educational institution or type of organization. Neustar's IP GeoPoint Higher Ed dataset was developed specifically to provide our largest retail customers with the ability to use inbound IP data to identify students who are eligible for special offers. As the product leader, your goal is to drive customer acquisition by making sure the online product offers and promotions you develop for colleges and universities get to the right students at the right schools. Without the ability to identify and parse incoming traffic by IP address as part of your decisioning flow (e.g. ucdavis.edu), efficiently serving up targeted webpages with customized offers would be challenging and costly. You've heard from others in the industry, that Neustar's Higher Ed dataset has enabled some of the largest online retailers to accurately direct incoming traffic to pages and offers that are customized by school (mascot, colors, content, etc.) so with this data, you feel confident in your ability to effectively target by incoming IP address. In addition to tracking metrics on conversion, retention, revenue and growth, your team is measured by student satisfaction and loyalty. Since customer experience has a significant impact on student satisfaction, integrating accurate decisioning data that will reduce customer friction is important to you. IP Intelligence not only reduces friction throughout the online experience, but the Higher Ed dataset gives your Product and Marketing teams the ability to develop targeted student campaigns and promotions based on the two-year or 4-year college or university anywhere in the United States. This is a capability you have never had before so this provides the opportunity to enhance your brand while at the same time opens avenues to new revenue opportunities. Since you are responsible for selecting the IP decisioning data that will be integrated into the platform, you need to be confident the data provider has the resources and data quality to support not only your internal team, but also your product, marketing, security and fraud teams. Neustar not only has insight on over 99.99% of all routable IPs, but they have a professional services team available 24 x 7 to help you during design, production, QA and maintenance. Customer Care is the team that handles questions - and complaints - about your company's online offers. If a student cannot create an account, your team gets the call from the irate prospect. If a current student customer is being blocked from accessing their account, your team gets the call from the even more irate customer - or from their parent. If inaccurate IP geolocation data leads to a customer unnecessarily being locked out of his account - or sent to a fraud review queue - you know that will impact the customer experience and drive up your call volume. Accurate IP geolocation data by college and university, not only helps students, but it helps lighten the load on your customer care team. Neustar IP Intelligence provides MLBAM with granular IP decisioning and Internet connectivity data, allowing them enforce blackout rules while also providing insight into potentially risky Internet connections. Neustar’s IP GeoPoint Higher Ed dataset was developed specifically to provide our largest retail customers with the ability to use inbound IP data to identify students who are eligible for special offers. 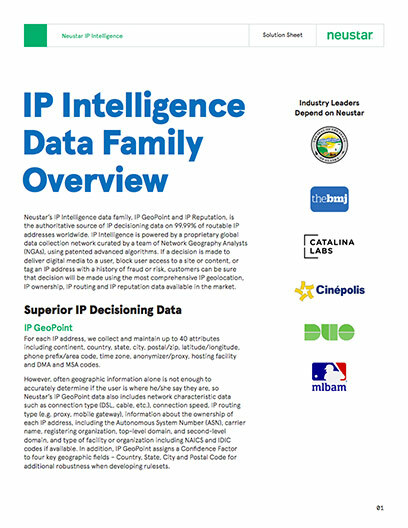 Neustar's IP Intelligence data family, IP GeoPoint and IP Reputation, is the authoritative source of IP decisioning data on 99.99% of routable IP addresses worldwide.